1. who are the women who are members in the "women and stories in Jerusalem" community? The "women and stories in Jerusalem" community consists of women from Jerusalem: Ultra-Orthodox, secular, religious and Arab, living all over the city who have an interesting story or a unique accommodation space. The cross-sectoral friendships and cooperations created within the community, allow - to whomever is interested - to experience varied forms of accommodations in a number of homes in the project. 2. Who is the visiting experience in the "women and stories in Jerusalem" for? 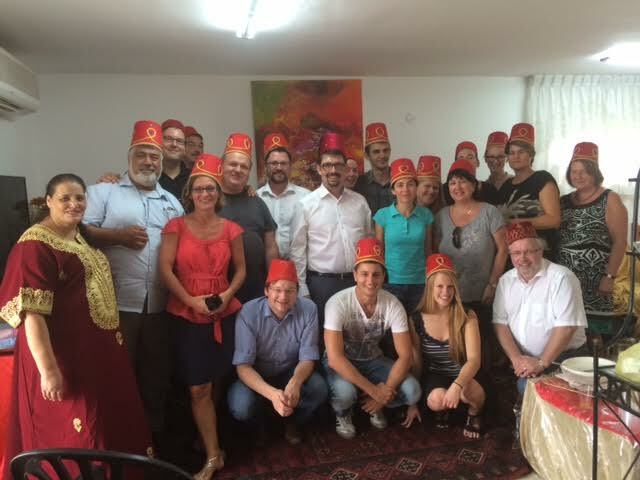 The visit is for groups from Israel and abroad, who are interested in experiencing a unique touring experience. The visit is also for single visitors, who are invited to stay at our artists' house, members of "Studia" who open their studio for familiarization and sale. 3. What kinds of unique activities do you offer? Special offers can always be found during the holidays, during Jerusalem month and In March - Women's month. In addition, there are special experiences for bachelorette parties and birthdays. It's advised to keep up to date no our Facebook page and get constant updates on activities. 4. What languages are spoken by the hostesses? The hostesses usually speak Hebrew. Some of the members speak Arabic, English, French, Spanish, and Russian. 5. What is the maximal number of participants you can accommodate in a group to experience "Women and Stories"? We are equipped to accommodate hundreds of participants. In such a case, the group will split between a number of different houses. Most houses can accommodate around 20 participants, and some can hold up to 50 participants simultaneously. 6. Is this a paid experience? Of course. The in-house accommodations as part of the "Women and stories" experience, provides the livelihood for the members of the project. 7. How much does the visit cost? The price varies, depending on the type of accommodations and the refreshments served. The prices fluctuate between 30 NIS per participant to over 200 NIS. 8. How do I order a visit? The order is made directly by speaking to the members of the project. Their phone numbers appear in the "Women and Stories in Jerusalem", and you are encouraged to call them directly to place an order. 9. How is the payment done for the accommodation part of the experience? The payment should be made directly to the hostess. 10. Who can join the "Women and Stories in Jerusalem" community? Women from Jerusalem with an interesting story and hospitality skills, who live in an area suitable for accommodating people, can contact us and we will look into the possibility of incorporating them into the project. 11. If I'm not from Jerusalem, can I still join the community? As stated, this community is for women from Jerusalem only, and is meant to promote them. 12. Where can I get further details or someone to talk to?